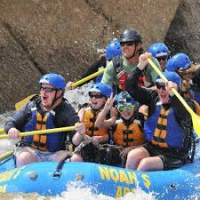 Experience Colorado's #1 rafted river with Noah's Ark Colorado Rafting – a nationally recognized industry leader in outdoor recreation. Specializing in Colorado family adventures since 1983. Discover world-class rafting through Browns Canyon National Monument! Book now to explore the 14,000-ft. mountain scenery and beauty of the Arkansas River. Combine trips with activities like hot springs, rock climbing, hiking, horseback rides, or the Aerial Adventure Park for package rates.